How can we make cities safe against flooding, heavy rainfall, drought and heat? City planners, engineers, policy makers and interest groups increasingly find themselves faced with the challenge of making cities safe from the consequences of climate change. Over the past few years, much research has been carried out in this area, and books full of possible measures have been written. The Climate App, a new free tool, ensures simple and rapid access to all those measures. The Climate App has been developed for worldwide application and has been tested in Ho Chi Minh City, Copenhagen and New Orleans. In the Netherlands, the app has been tested in Rotterdam, Delft and the Province of Utrecht. The app offers a wealth of information and inspiration relevant for any new building, restructuring or renovation project. 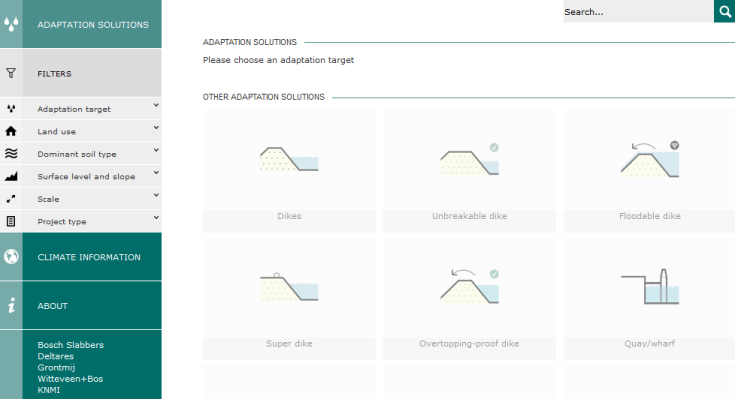 Based on simple criteria such as scale, land use and product type, the app selects and ranks possible climate adaption measures. As a result, the user is provided with a rapid overview of the most relevant measures available. The testers have all experienced the fact that the urban living environment can successfully be made climate proof by joining forces in the search for solutions, using the app as a source of inspiration. The app supports the process of combining measures at city, district, street or building level. Use of the app in pilot cities shows that the tool works very quickly and as such is eminently suitable for use in workshops and training sessions for city planners, engineers, policy makers and interest groups. The tool was developed by a consortium consisting of Grontmij, Witteveen+Bos, Deltares, the KNMI (Royal Netherlands Meteorological Institute) and Bosch Slabbers Landscape + Urban Design, and co-financed by the Stichting Klimaat voor Ruimte and the Stichting Climate Adaptation Services. The Climate App can be used via www.climateapp.nl and is available in the Apple Appstore and Google Playstore.